Back 1998 a young female wolf swam the Snake River and crossed into Oregon from Idaho eventually settling in the Blue Mountains in what would be a fruitless search for a mate. However, wolf B45F wore a radio collar broadcasting her location, and after much controversy, she was captured and returned to central Idaho. 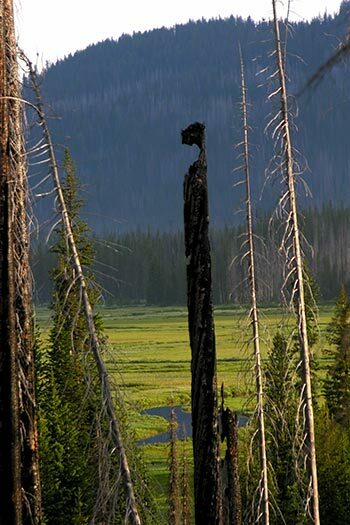 Back in Idaho, she always hung out about 2030 miles north of McCall in Western Idaho in the Secesh River, Squaw Meadows, Clochman Saddle, Burgdorf, Carey Dome Country. She was seen from time-to-time in the company of uncollared wolves, but it is not known if she was basically a loner, a pack member, or even the alpha of one of the many packs that have come and gone, and keep coming in the general area — perhaps the Carey Dome Pack or the Partridge Creek Pack? Her skeleton was found by a Wildlife Services agent in Squaw Meadows Oct. 16. Grass was growing through it, but her radio collar’s numbers could be deciphered. There is at least one wolf currently wandering in NE Oregon, probably more, but recovery has been slow and B45 was an early pioneer. I took the photo above of Squaw Meadows on June 30 this year. Her skeleton was out there somewhere. Instead I spent my time wandering around Clochman Saddle. Thank you for letting us know about wolf B45. Whenever I pass through eastern Oregon, I always wonder what became of her. She truely is an unforgetable wolf, and I am sure the people of Oregon might think that too, one way or the other! What was the cost involved when thay had to transport her back to Idaho, and was is funded by a group or through taxes? The cost was probably a lot less than pulling to scared Forest Service employees from the wilderness because they heard wolves howling. I always feel sympathetic when hearing of lone wolves since they have such strong pack instincts and social mentalities. I like to hear she was in company of other wolves from time to time. Thank you for posting previous stories of wolf B45. Re: Ralph’s comment above on the USFWS’s refusal to pick up and “translocate” B45 after her first adventure outside the three-state experimental area–would that the experimental, non-essential population rule in the Southwest allowed the Service to do the same. Part of the reason the Mexican wolf population is lagging behind projections in the Final EIS is the fact that wolves establishing territories outside the invisible, odorless boundaries of the Blue Range Wolf Recovery Area (BRWRA) must be trapped and translocated back into the recovery area or taken into captivity. The result of all this trapping and translocating has too often been the disintegration of packs and the needless deaths of dispersing wolves. Scientists have repeatedly (in both the Three Year (2001) and Five Year (2005) Reviews of the project) recommended that the rule be amended to allow free movement of lobos. To date, no action has been taken.